Beaker Dyeing Machine – Infra-Red – Q – Test. For fibre/yarn/fabric dyeing purposes in lab conditions. Heating media is advanced infra-red rays. Eliminates use of glycol & frequent cleaning of beakers. You can measure temperature of solution inside the beakers. Special dosing system for chemical addition. Table top, ergonomically design – maintenance free and noise free. 0-140 degree centigrade temperature range.12 beakers of 250 ml each is beaker capacity. Net weight: 92 kg for table top model & 180 Kg for floor model. Net Dimension: length×depth×height 29”×15”×24”for table top model & 38”×27”×33” for floor model. Beaker Dyeing Machine – HTHP – Q-Test. For fibre / yarn / fabric sample dyeing purposes at 140o in lab conditions. Fitted with digital temperature and timer controller -PID. 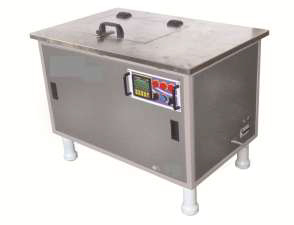 For rapid cooling machine is equipped with copper pipe through which water is made to pass through continuously if required. Microprocessor controller with 6 stage programming option at extra cost. Beaker capacity of 250 ml or 500 ml. No. of beakers options of 8 & 12 available. 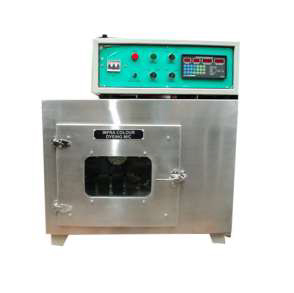 Beaker Dyeing Machine – Open Bath – Q- Test. 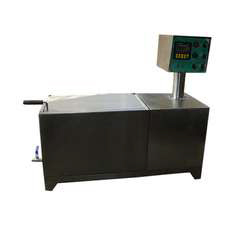 For fibre / yarn / fabric sample dyeing purposes at 95o in lab conditions. steps, LCD displaying program number, steps, gradient, hold time and hold temperature on the screen with service free controller. Stainless steel 304 used in major parts .Beaker of SS 316 – leak proof used. Temperature can go up to 99 oC .